#5 "5 AD&D, 1 D&D & 1 Oriental Adventure"
This roadside stop could well be your very last. An AD&D adventure for character levels 7–9. Even ladies in distress aren't all that they seem. An AD&D adventure for character level 1. A missing tome, a trail of clues, and an unusual cult. An AD&D adventure for character levels 1–3. An unusual visitor who likes villagers—medium rare. 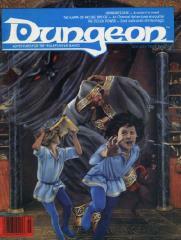 An AD&D Oriental Adventures adventure for character levels 2–5. A midnight encounter with a halfling guerilla and a vengeful magic-user. A D&D adventure for character levels 1–3. A promise of adventure and riches, with a hint of total annihilation. An AD&D adventure for character levels 10+. Hirward the Wizard has a little problem on his hands—and it's destroying his fortress, followers, and future. An AD&D adventure for character levels 4–7.